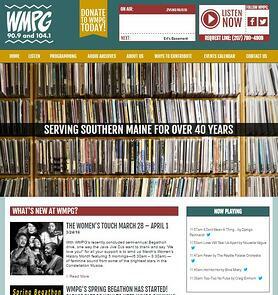 We recently launched a newly designed and developed website for Portland-based community radio station, WMPG. The new WordPress website was custom built and uses a responsive framework to alter for all devices. One of the most important features of the new website is the ability to archive shows for on-demand streaming later; an aspect valuable to WMPG and its listeners. "We built WMPG a website using the WordPress CMS platform so that site administrators wouldn't have to rely on a web developer for site edits," said Jeremy Lindemann, Senior Front-End Web Designer at Page One. He added that his team made the navigation "more simple for the end-user and more intuitive. The design is clean and professional but also represents the radio station's fun and funky culture."